As the 2019 Legislative Session nears its crossover deadline this week, the House of Representatives has passed nearly 500 bills during a productive session focused on good government, homelessness, and education. Majority Leader Della Au Belatti said significant bills have been passed this session regarding campaign finance reform, elections issues, ending public corruption, and important social and economic issues including minimum wage, sea level change, and replacing the Aloha Stadium. Crossover is the deadline by which a final vote must be taken in the bill's originating house to pass the bill on third reading, enabling it to cross over to the non-originating house for consideration. HB1382 HD2 Prohibits campaign fundraising on the property of any person who has accepted legislatively appropriated funds that exceed an as-yet unspecified value or received or rendered services to the State. HB164 HD1 Provides voters with greater transparency and reporting for noncandidate committees, which currently allow some individuals to wield an unreasonable unequal influence on elections, by replacing "person" with "noncandidate committees" in electioneering communication law, thus requiring noncandidate committees that spend more than $2000 during any calendar year to: provide the Campaign Spending Commission with information including who runs the committee, who authorizes expenditures, the amounts expended and to whom, who contributed to the committee, the names of any candidates the committee's advertisements supported or opposed, and whether any advertisement was made in coordination or cooperation with a candidate, candidate committee, or noncandidate committee. HB712 HD1 Requires candidates for president, vice president, governor, lieutenant governor, or mayor to disclose their federal income tax returns in order to be listed on a general election ballot. Prohibits electors from voting for candidates for president or vice president if those candidates have not disclosed their federal income tax returns. HB1217 HD1 Requires that all people who apply for a driver's license or identification card complete a voter registration application, and automatically registers each qualified applicant for voting unless the applicant affirmatively declines to register to vote. HB391 HD2 Enacts state-law legislation of the federal Hatch Act: Establishes restrictions on how certain state employees and officers who perform adjudicatory, regulatory, law enforcement, or investigatory duties may participate in partisan political activities. HB361 HD1 Prohibits the Governor or any county mayor, while holding those offices, to maintain any other employment or receive any emolument, beginning on the sixty-first calendar day after their election or appointment to office. HB1381 HD1 Prohibits former legislators and executive branch employees subject to senate confirmation from engaging in lobbying for 24 months after termination of employment as a legislator or executive branch employee. 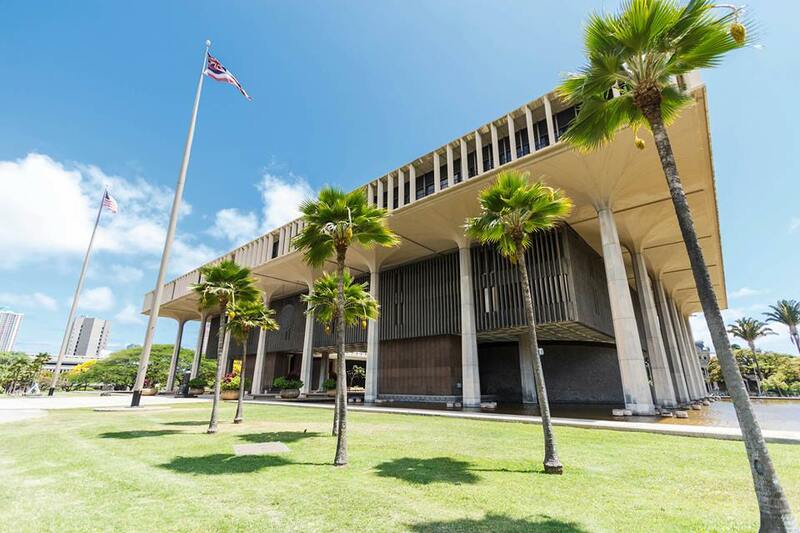 HB1451 HD3 Extends the Ohana Zones Pilot Program to June 30, 2022, and extends the Emergency Department Homelessness Assessment Pilot Program and Medical Respite Pilot Program to June 30, 2020. HB257 HD2 Authorizes the use of private lands for the Ohana Zones Pilot Program. Extends the Ohana Zones Pilot Program to June 30, 2022, and extends the Emergency Department Homelessness Assessment Pilot Program and the Medical Respite Pilot Program to June 30, 2020. HB1221 HD2 Amends Hawaiʻi's criteria for involuntary hospitalization so that law enforcement and hospital workers can intervene and temporarily take individuals into involuntary hospitalization for not taking psychiatric medication or pursuing mental health treatment. HB285 HD1 Requires county police departments to allow public access to information about suspended officers and to disclose the identity of officers who are suspended or discharged to the Legislature. HB488 HD2 Prohibits an employer from requiring an employee, as a condition of employment, to enter into a nondisclosure agreement that prevents the employee from disclosing sexual harassment or sexual assault occurring in the workplace, at work-related events, between employees, or between an employer and employee. Allows for confidentiality only at the employee's request or if the employee agrees to a confidential settlement. HB1165 HD2 Expands the available gender options on driver's license and state identification cards to include a non-binary option. HB1192 HD2 Expands the list of protected classes under Hawaiʻi's equal pay law to include gender identity or expression, sexual orientation, age, religion, color, ancestry, disability, marital status, arrest and court record, and domestic or sexual violence victim status. Requires employers to provide wage ranges to employees and prospective employees. Clarifies the factors that employers can use to justify differences in compensation. HB1143 HD2 Requires that teachers teaching at hard-to-staff schools be paid the greater of either the national average of a similarly situated teacher, with annual cost of living adjustments, or according to the teacher's salary schedule. Requires that teachers who are paid the national average forego any pay differential. HB921 HD2 Establishes an Executive Office on Early Learning to oversee state-funded early learning programs, except for special education and Title I-funded pre-kindergarten programs. HB1326 HD2 Extends revocable water rights permits to allow for ten consecutive one-year holdovers of water permits, and requires the automatic continuation of water permits while contested cases are pending until the completion of the proceedings. HB419 HD2 Allows counties to receive state funds to enforce transient accommodation laws. HB89 HD2 Holds property owners or renters criminally liable for the possession or explosion of aerial devices on their property, and allows police to use witness accounts, photographs, video or other recordings as probable cause for arrest. HB497 HD1 Establishes a task force to examine the illegal import of fireworks and contraband into Hawaiʻi. HB201 HD1 Gives state, county, and authorized agents the authority to enter private property to control and eradicate invasive species. HB931 HD2 Prohibits a landlord from evicting a tenant if the landlord fails to maintain the habitability of the premises and the tenant continues to pay fair-market value of the rent. Caps a tenant's rent at the fair-market value if the habitability of the premises is significantly impaired. Allows tenants who are wrongfully removed to recover two months' rent or two months' free occupancy. Allows landlords to recover possession of the premises once it is restored to a habitable condition and upon termination of the rental agreement. HB748 HD2 Prohibits civil asset forfeiture unless the owner is convicted of a felony. Requires that half of all forfeited property is distributed to the Hawaiʻi Law Enforcement Assisted Diversion Program and half to the general fund. HB1305 HD2 In the case of a natural disaster or emergency, authorizes State electric and gas utilities to enter into a mutual assistance agreement with out-of-state utilities to assist in the restoration of the State's electrical or natural gas power. HB1497 HD3 Establishes the Stadium Development District comprised of all state land under the Stadium Authority's jurisdiction. Authorizes Hawaiʻi Community Development Authority to facilitate the development of all state property within the District including building a new stadium. HB118 HD1 So as not to conflict with federal proceedings, repeals the requirement that the Auditor conduct an annual review of certain rapid transportation authorities in the State. Click here for a list of all 497 bills passed by the House of Representative so far this session.